Interpretation in English of "God's Grandeur". 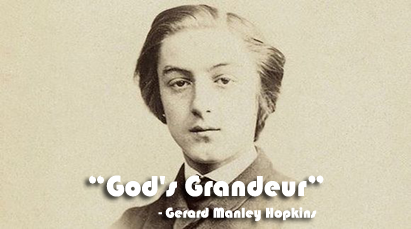 "God’s Grandeur" is a fine religious poem written by Gerard Manley Hopkins. Though Hopkins lived and wrote in the 19th century, he is one of the leaders the modernist movement in poetry. His poem too, were published in the 20th century, first by Bridges in 1918 and then by Charles William in 1930.Hopkins was influenced at oxford by john Henry Newman and he converted to Roman Catholicism in 1866 and became a Jesuit two years later. “God’s Grandeur” starts off with a claim: the earth is full God’s special power, God’s vitality. But the earth is ultimately temporary. The fire will go from it one day. It will reach a peak, then slowly spread, and then collapse. (This is confusing – don’t try to take Hopkins too literally. Let your imagination feel and see the images he presents). The speaker states that the natural world is inseparable from God, but at the same time temporary. The speaker wants to know why people don’t take better care of the natural world. Why don’t they recognize and respect the power of God that is running through our environment? He says that people have been endlessly tromping and trudging through the world for so long, and now the surface of the earth is calloused and burnt over by industry. It looks blurry and out of focus with all this industry, and endless hard work covering it. According to the speaker, we humans stunk up (causing bad smell) the earth – everything looks and smells like people, and all the bad things people do. (The speaker doesn’t sound too keen on people here.) The ground we walk on doesn’t have any flowers or trees or grass on it. And we have to wear shoes, so we can no longer feel the ground itself. We have lost our connection with the natural world. But don’t worry – the speaker assures us – nature never stops. It’s hiding underground, like a hidden spring. And even though the sun always sets in the west bringing darkness and night, it always rises again in the east, bringing light and morning. The speaker assures us that morning follows night, and light follows darkness, because the Holy Ghost is always hovering over the messed up world, pondering deeply, and worried. The upside, though, is that the Holy Ghost watches over the world and treats it in much the same way a bird would treat her unhatched eggs, providing comfort, security, warmth, beauty, and motion. The first four lines of the octave (the first eight-line stanza of an Italian sonnet) describe a natural world through which God’s presence runs like an electrical current, becoming momentarily visible in flashes like the refracted(changing) glinting(flash) of light produced by metal foil (metal in thin sheet) when rumpled or quickly moved. Alternatively, God’s presence is a rich oil, a kind of sap (fluid) that wells up “to a greatness” when tapped with a certain kind of patient pressure. Given these clear, strong proofs of God’s presence in the world, the poet asks how it is that humans fail to heed (“reck”) His divine authority (“his rod”). The second quatrain (four-line verse) within the octave describes the state of contemporary human life—the blind repetitiveness of human labor, and the sordidness (worst human nature) and stain of “toil” and “trade.” The landscape in its natural state reflects God as its creator; but industry and the prioritization of the economic over the spiritual, have transformed the landscape, and robbed humans of their sensitivity to the those few beauties of nature still left. The shoes people wear sever (put apart) the physical connection between our feet and the earth they walk on, symbolizing an ever-increasing spiritual alienation (isolation) from nature. The sestet (the final six lines of the sonnet, enacting a turn or shift in argument) asserts that, in spite of the fallenness of Hopkins’s contemporary Victorian world, nature does not cease offering up its spiritual indices. Permeating (spreading through) the world is a deep “freshness” that testifies to the continual renewing power of God’s creation. This power of renewal is seen in the way morning always waits on the other side of dark night. The source of this constant regeneration is the grace of a God who “broods” over a seemingly lifeless world with the patient nurture of a mother hen. This final image is one of God guarding the potential of the world and containing within Himself the power and promise of rebirth. With the final exclamation (“ah! bright wings”) Hopkins suggests both an awed intuition of the beauty of God’s grace, and the joyful suddenness of a hatchling bird emerging out of God’s loving incubation. 0 Response to "Gods Grandeur | Interpretation | Understanding The Poem | Class 12"